This timeless traditional chest from Home Styles blends well into any style of decor. Its manufactured wood exterior is finished in a tasteful white colour. The Washington Trunk Set offers vintage appeal coupled with durable functionality. This 3 piece set is highly versatile for storage, tabletop, or impromptu seating. Increase floorspace by nesting 1 or both small trunks inside the larger. Antiqued nail head detailing gives each piece an authentic and timeless style. Slam proof hinges provide easy access to spacious interior storage tucking away throws, books and other home essentials. The Washington is a classic, yet smart addition to any living space. Take the Hyde accent chest on a tour of your home, moving it anywhere you need extra storage and surface space: living room, dining room, den, great room, even office. With its trolley-style wheels, perforated metal doors and microphone-inspired hardware,this cabinet is ready to rock 'n' roll. Naples 36-inch x 36.5-inch x 16.5-inch 4-Drawer Chest in White This timeless traditional chest from Home Styles blends well into any style of decor. Its manufactured wood exterior is finished in a tasteful white colour. 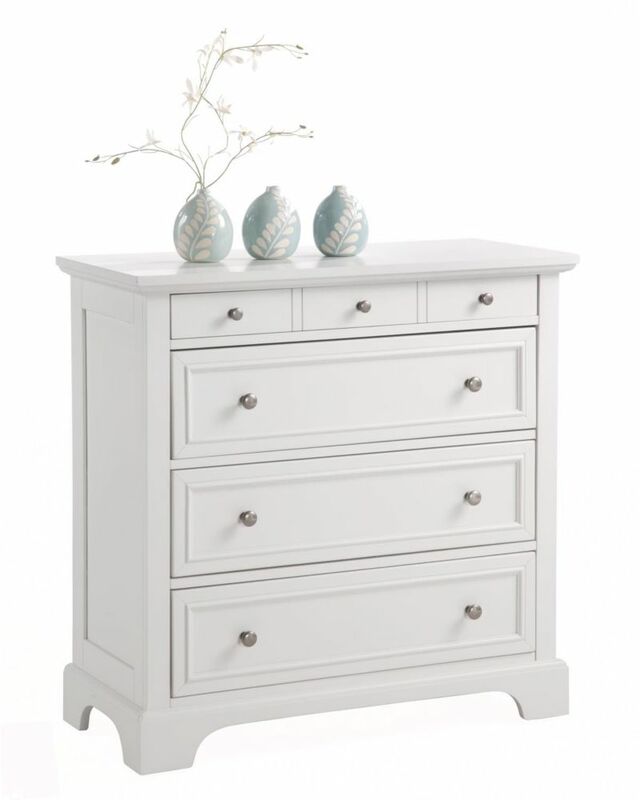 Naples 36-inch x 36.5-inch x 16.5-inch 4-Drawer Chest in White is rated 2.0 out of 5 by 1. Rated 2 out of 5 by Muffy8366 from Colour not as shown! We bought this for my daughters room as she has other white furniture however this dresser is not even close to white or even off-white. It is very cream coloured. Not at all how it is pictured.